Hailing from the same hometown as our own Dion Baia, Ermes Effron Borgnino was born in Hamden, Connecticut, in January of 1917. His mother brought him back to his native Italy, where he lived for a number of years on the Isle of Capri. At the age of 7, they both traveled back and settled in their family home on Cherry Ann Street in Hamden. Not knowing what to do with his life after graduating high school, Mr. B joined the Navy and spent ten years serving our country. Upon returning home, he was again confronted with the age-old question we all come to face, “what are you going to do with the rest of your life?” Mr. B has reminisced that around this time, while trying to find work, he would observe legions of very young “old” men entering and exiting factories everyday, committed to a life of monotony and boredom, which he immediately rejected. Instead, his days were filled with eating his lunch in the park, feeding the birds and contemplating the “ifs”. Then one night while sitting in the kitchen, his mother asked the glorious question, “Why not try your hand at acting?” She observed that he regularly liked to make a fool of himself anyway, so why not try doing it professionally? It is at this moment, Mr. B says, he saw a glorious light come into the kitchen, like doors opening, and he immediately knew that his mother was right. That would be his career. And the rest is history. 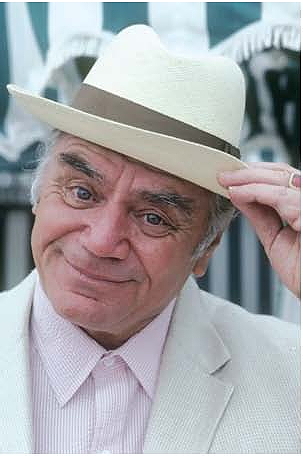 Mr. Borgnine has acted in over a 175 films, many of which you have seen, with numerous television appearances under his belt, including regular series’ McHale’s Navy (1962-66), Airwolf (1984-86), The Single Guy (1995-97), All Dogs Go to Heaven: The Series (1996-98) and the currently running phenomenon, SpongeBob SquarePants (1999-present). He received a Best Actor Oscar®, a Golden Globe, and a BAFTA award (for best foreign actor) for his role in 1955’s Marty; he has been nominated for a Daytime Emmy and nominated 3 times for an Emmy Award, along with countless other awards from various festivals. Mr. Borgnine got his star on the Hollywood Walk of Fame in 1960. So why do The Podwits dedicate time for a “Borgninian Moment” in every podcast and have a page about him on their humble site? Mr. Borgnine is an institution. He has literally done it all. He started his career in the late ’40s and hasn’t stopped since. Drop a name and you’ll find that Mr. Borgnine has either worked with them or knew them. Beyond that, he can also be called the iconic “character actor”. Like other greats—Harry Dean Stanton, Ed & Keenan Wynn, Bruce Dern, M. Emmett Walsh, Peter Lorre, Gary Oldman and Dwight Frye, to name but a few—Mr. Borgnine exemplifies what it is to be a character actor. He can take the most mundane, horrible and boring piece of expository dialogue and turn them into cinematic gold, sounding as if William Shakespeare had penned them himself. We here at the Podwits salute Mr. Borgnine. He is a breed which is slowly becoming a minority, and we make it our mission here to “hip” as many people as we can, to the man, the myth and the legend that is and forever will be… Ernest Borgnine. The Podwits were saddened to learn of the passing of Mr. Borgnine on Sunday, July 8, 2012, at the age of 95. Mr. Borgnine died with his wife and children at his side. We will forever miss the Hollywood legend.